With so many artists and bands being inspired by John Lennon’s music, it’s no surprise his music is so widely covered. For many artists, it’s their way of paying homage to one of the most articulate, perceptive and intelligent songwriters in the history of modern music. Sadly, the results however, have varied greatly. Some have been far from memorable. They haven’t come close to producing a fitting tribute to one of the most important, innovative and influential singer, songwriter and musicians ever. Other artists however, have produced fitting, poignant and beautiful homages to John Lennon and his music. The latest band to do this, are The Nutopians. 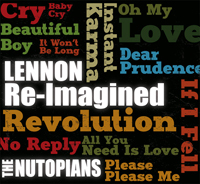 The Nutopiains’ sophomore album Lennon Re-Imagined, like 2010s Imagined, celebrates the undisputed genius of John Lennon. Lennon Re-Imagined will be released on 1st July 2013, with a percentage of the profits being donated to WhyHunger, the Artist Against Hunger and Poverty Program. Similarly, The Nutopians donate a percentage of the ticket sales from each show to WhyHunger. This is especially fitting, and is The Nutopians’ way of honouring John Lennon’s “social and political activism.” Even more fitting are the thirteen tracks on Lennon Re-Imagined. Ranging from poignant and powerful, to beautiful and emotive, Lennon Re-Imagined is one of the best homages to John Lennon you’ll ever hear. Before I tell you why, I’ll tell you about The Nutopians. For anyone yet to discover the music of The Nutpoians, they’re an eight-piece band that comprise some of the most accomplished folk-rock musicians of their generation. Indeed, the pedigree of The Nutopians’ founding members is unrivaled. Rex Fowler is a member of Aztec Two-Step, while Tom Dean is a member of Devonsquare. Both bands were part of the seventies folk-rock movement. Aztec Two-Step’s recording career started back in 1972, when they were signed to Elektra Records. For any folk-rock group, Electra was the record label to sign to. Sadly, Aztec Two-Step was their only release on Elektra. Next stop was RCA, where they released three albums between1975 and 1978. Two’s Company, released in 1978, was the last album Aztec Two-Step released on a major label. Their career was far from over. After that, Aztec Two-Step continued to tour and record. While they might not be signed to a major label, they’d build up a large and loyal fan-base over the years. As bands that once were their contemporaries split-up, Aztec Two-Step went from strength to strength. Anniversaries came and went. Twenty-five years became thirty, and then in 2011 Aztec Two-Step celebrated their fortieth anniversary. A year later, came the release of Aztec Two-Step’s eleventh studio album Cause and Effect. Not many bands could match the longevity Aztec Two-Step enjoyed. Four decades later and they’re still touring and regularly. Devonsquare come close, but not quite close enough. Devonsquare were formed by Tom Dean, Alana MacDonald and Herb Ludwig in 1976. This was the start of a musical journey that would last thirty-five years and see Devonsquare released five albums. Their debut album was Devon 2, which was released in 1984. A year later, Devonsquare released their sophomore album Night Sail. Like their debut album, it was independently released. Soon, the three members of Devonsquare’s lives would be transformed. Ammet Ertegun founder and chairman of Atlantic Records happened to hear Devonsquare’s song Walking On Ice. Realizing Devonsquare were a group with potential, they were signed to Atlantic Records. This was the musical equivalent of The Nutopians hitting a series home runs.Their first album for Atlantic was Walking On Ice, which was released in 1988. Four years later, Devonsquare released their second album on Atlantic. Bye Bye Route 66 was released in 1992. While it wasn’t a huge commercial success, it featured several critically acclaimed singles, including If They Could See Me Now. Following Bye Bye Route 66, Devonsquare left Atlantic. Like Aztec Two-Step, their career was far from over. Having left Atlantic, Devonsquare continued to tour and released one more album. Their trademark three-part harmonies had attracted a loyal fan-base. Devonsquare toured extensively, usually to packed concert halls. Then in 1996, Devonsquare released their fifth album Industrial Twilight. Developing themes from Bye Bye Route 66, including the influence of the beat poets on modern sensibility and language, Industrial Twilight was hailed a minor classic. Although Devonsquare didn’t release any further albums, Tom Dean released two solo albums. His debut album was 1999s Your Own Backyard. Then after a gap of five years, Tom released Pennies. Sadly, a year later, tragedy struck for Devonsquare. 2005 saw founding member of Devonsquare Herb Ludwig died. He’d been undergoing heart surgery, but died from complications. This hit other members hard. Eventually, a decision was made to make bassist Ted Gledon and guitarist Robby Coffin members of Devonsquare, who continued to tour. However, from 2009, the members of Devonsquare were dividing their time between Devonsquare and The Nutopians. When Rex Fowler of Aztec Two-Step and Tom Dean of Devonsquare met, they discovered they both shared a love of the music of John Lennon. That wasn’t the other thing they shared. They came from similar musical backgrounds. So, in 2009, they decided to form a band to celebrate the genius of John Lennon. Their idea was, to record an album of John Lennon’s music. This was their way of paying tribute to, and celebrating a true musical visionary. Another way to do this, was to give a percentage the profits from the album and their live shows to WhyHunger, the Artist Against Hunger and Poverty Program, which was founded by Harry Chapin. Considering John’s record of “social and political activism,” this is particularly poignant. When Yoko Ono heard about this project’s involvement with WhyHunger, she gave it her blessing and christened the band The Nutopians. For non-students of John Lennon, Nutopia was the fictitious country John founded in the early seventies, when he was promoting world peace. Now the newly christened Nutopians would enter the studio to record ten John Lennon songs. Comprising members of Aztec Two-Step and Devonsquare, The Nutopians headed into the studio. The result was The Nutopians‘ debut album Imagined, which contained a combination of Beatles and John Lennon songs. Released to critical acclaim, Imagined was hailed as poignant, homage to John Lennon’s creativity and genius. Imagined then won the Independent Music Awards Vox Pop 2010 Tribute Album of the Year Award. Meanwhile, The Nutopians were touring the world, and in the process, were sharing the stage with Bruce Springsteen, Jackson Browne and Bonnie Riatt. By now, word had spread of The Nutopians’ live show. They were perceived as one of the best bands of the time. Considering the collective experience of its members this is no surprise. Soon, it was time for The Nutopians to record their sophomore album. For recording of Lennon Re-Imagined, Rex Fowler of Aztec Two-Step was joined by Tom Dean, Alana MacDonald, Teg Glendonof and Robby Coffin of Devonsquare. Joining them were Robby’s daughter Maggie, Gary Schreiner and Jordan Jancz. The eight Nutopians covered thirteen John Lennon songs. Again, this was a mixture of Beatles’ songs and songs from John’s solo career. These songs were given an innovative and inventive twist by The Nutopians. To do this, they combine an eclectic selection of instruments. This includes a cello, violin, accordion, percussion, mandola and twelve-string guitars. The result is Lennon Re-Imagined is a truly captivating and enthralling album, which will is a fitting, poignant, powerful and beautiful homage to John Lennon, which I’ll tell you about. Opening Lennon Re-Imagined is a melancholy, but beautiful interpretation of You’re Gonna Lose That Girl. Key to that is Tom Dean’s heartfelt lead vocal. Filled with emotion and even a hint of sadness, Tom tells his friend: “You’re Gonna Lose That Girl.” As he sings that lyric, it’s almost with a hint of resignation. That adds to the sense of melancholia. So too does Gary Schreider’s contribution. He adds a chromatic harmonica and accordion, before urgent, soulful harmonies sweep in, playing their part in the best covers of this song I’ve heard. A really subtle, understated version of No Reply is the perfect way to follow You’re Gonna Lose That Girl. Rex Fowler takes charge of lead vocal, delivering his vocal with passion and feeling, while the arrangement combines elements of folk-rock and alt-country. This is a potent combination, that results in heartachingly beautiful interpretation of a Beatles’ classic. Beautiful Boy is the first of the songs from John Lennon’s solo career. Again, the arrangement is understated, allowing Alana MacDonald’s vocal to take centre-stage. Gradually, the arrangement decides to reveal its secrets. Layers of music unfold. Strings, guitars, percussion and bass. With each listen, something new is revealed. However, what makes the song, is Alana MacDonald’s emotive vocal. On, Dear Prudence, an oft-covered Beatles song, The Nutopians reinvent the song. While other covers of Dear Prudence have much fuller, electric arrangements, this arrangement is a much more spartan, acoustic arrangement. It still stays trues to the song’s sixties roots. Slow, spacious and sometimes, spacey, the song has a sixties sound. The rest of the band set the scene for Maggie Coffin, whose just seventeen years old. Delivered against strings, Maggie’s vocal, has a sixties sound and influence. This a fitting way to pay homage to not just John Lennon, but one of the finest songs on The White Album. A medley of Cry Baby Cry and Bungalow Bill sees Rex Fowler sound not unlike John Lennon. The similarity is uncanny. This is the first time I’ve noticed this. Accompanied by urgent harmonies, strident guitars and percussion, the tracks take on a real sixties sound. Although credited to Lennon and McCartney, it’s thought that I’ll Be Back was written by John Lennon. This is one of the best tracks from A Hard Day’s Night. Here, Tom Dean’s impassioned, heartbroken vocal is filled will emotion and regret. Just acoustic guitars, accordion and backing vocal accompany Tom. They stay firmly in the background, allowing Tom to deliver what is one of the best and most beautiful vocal on Lennon Re-Imagined. One thing you learn about The Nutopians, is don’t try to second guess them. Proof of this is And Your Bird Can Sing. It bursts into life. Energy and emotion fill Alana MacDonald’s lead vocal, which has a country sound. Rex adds backing vocals. Again, he sounds not unlike John Lennon. As for the arrangement, it’s a majestic mass of guitars, accordion and bass, which has a real country sound and feel. When it comes to protest songs, Revolution is one of the best. It’s an articulate plea for change. While The Beatles version was a mass of energy, passion, frustration and anger, The Nutopians version is very different. Slow, understated and hesitant, the song is transformed. One thing the song doesn’t lack, is passion, thanks to Maggie Coffin’s vocal. If I Fell has a real wistful, melancholy sound. That’s in part down to Alana MacDonald’s tender, pensive vocal, but mostly down to Gary Schreiner’s chromatic harmonica and the harmonies. The second medley on Lennon Re-Imagined features Please Please Me/It Won’t Be Long. Featuring Rex on lead vocal, the similarities with John are uncanny. He adds backing vocals, answering his own call. With the addition of harmonies and acoustic guitars, you wonder whether you’ve stumbled across a lost Beatles or John Lennon song. That’s how close to the original these tracks are. From the opening bars of Love/Oh My Love I was spellbound. I was totally enthralled by Rex’s tender, impassioned vocal. His delivery was perfect, breathing life and meaning into the lyrics from a song that features on John Imagine album. Accompanied by piano and harmonies, Rex delivers what is his best vocal on Lennon Re-Imagined. if I had to pick any Beatles or John Lennon song to close Lennon Re-Imagined, i’d pick the same song as The Nutopians, All You Need Is Love. An uplifting, joyous, inspirational song about unity is given a makeover, and totally transformed by The Nutopians. Opening with samples of John Lennon set against strings, guitars and harmonica, when John says: “the message is love,” the song unfolds. Rex delivers the vocal with power and passion. Accompanied by harmonies, harmonica and guitars a truly anthemic track proves a poignant way to close this homage to the genius of John Lennon. ← PHILLY RE-GROOVED 3-TOM MOULTON REMIXES.